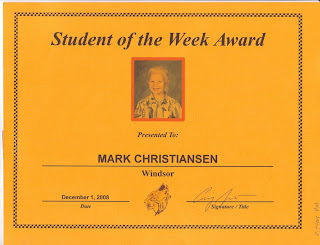 Mark was Student of the Week at school last week for outstanding behavior and academic performance. Mark is extremely smart and is a great student. Good job Mark! 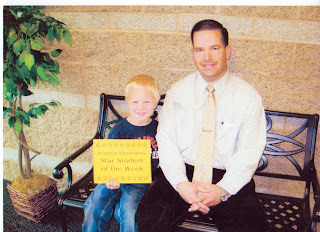 This is Mark with his the principal, Mr. Jensen. Kevin finished the doll house/toy and book organizer for Gwen. Kevin built it from scratch with no design plans. He did an amazing job and it looks beautiful. Thanks Kev! Halloween 2008! Mark was Batman and Gwen was a cowgirl. We had fun making pumpkins and Trick or Treating. My last single semester at BYU! I loved, loved, loved my roommates Emily, Laurie and Mary Ann. We were crazy and had toooooooooooo much fun. We all lost touch, and I miss them so much. But the other day, Mary Ann found my blog. She has such a cute family. Love you Mary Ann! I could not help but laugh looking at these pictures. Click on the picture below to see more! Thanks to our good friends, the Bauers, we spent a wonderfully fun Saturday on the lake. Here are some pictures of us enjoying the water. Mark was an amazing waterskier. I could not believe that he was actually skiing. And everyone loved the big tube. Gwen was so relaxed she feel asleep on the tube and then later in the boat. June was full of fun in the sun. Mark and Gwen loved swimming lessons. Gwen was not so sure at first. Everyone got a kick out of her when she walked to the pool all the while crying, "I'll be fine! I'll be fine!" She soon began begging to swim morning, noon and night. And Mark did awesome. He is becomming quite the swimmer. He enjoyed trying out the snorkle for the first time. We ended up buying one for him to use in our little pool at home. We went to the zoo with lots of our friends. We love the zoo. We watched the bears go in and out of their cave. We showed the penguins our Happy Feet. All but Gwen got to ride on the new Endangered Animal Carousel. Gwen wanted nothing to do with it. In June, Mark and Kevin enjoyed the Father and Sons campout. Mark brought his remote FJ Cruiser. They ate Hot Dogs and S'mores. But I believe the highlight was watching Davis' Dad gut fish he had caught. We also spent some time at Summerfest. It was at Summerfest that Gwen finally realized her love for the Carousel (and all the fair rides). Wow, I keep thinking of everything we did in June. Kevin and I ran our first 5k. I was glad he would run with me because I was nervous about my first race. We also spent some family nights at Thanksgiving Point. The pictures included are of the Harry Potter themed night. The last time I posted it was April. A lot has happened since then, and I have been too crazy and busy to keep up. So here come lots of pictures. Mark graduates from Miss Roxi's Preschool and celebrates his 5th Birthday. I can't believe he will be going to kindergarten in the Fall. Mark had a rocket birthday party complete with a rocket cake and real sparklers. All Mark's friends made rockets and we launched them with the rocket launcher Kevin made. We all had a BLAST! However, after all 15 five-year-olds went home, we decided that next year we would have a smaller family party. At the end of May we spent a long weekend in Vernal, Utah. We enjoyed hiking to dinosaur tracks and dinosaur bones, learning at the dinosaur museum and swimming in the hotel pool. I will post some pictures of our June and July adventures soon! Here are some pictures of our family enjoying the end of Winter and the coming of Spring! This last weekend, Kevin and I celebrated our 8th anniversary. We spent the night in a cabin at Sundance. We enjoyed the fire, the snow, the hot tub and just being together. It was fun to talk about memories of the past and dreams for the next 8 years. I had a perfect weekend with my best friend, the love of my life, my one. The view from our private hot tub!! Look at all the snow. Amazing. And thanks to my cousin Jessica who watched the kids for us. It was nice to get away for awhile and just relax and enjoy being husband and wife not mom and dad. Kevin and I bought a new bed last weekend, and we helped the kids turn the boxes into a pretty sweet little fort. However, it is unlike any fort we ever had as kids. This home is complete with a PVC pipe faucet, a hanging chandelier (flashlight), and a personal computer. Mark and Gwen are having lots of fun playing house. This is Mark's new pose for all his pictures. Is he cool or what? Oh, and Gwen is just the cutest girl we have ever seen!